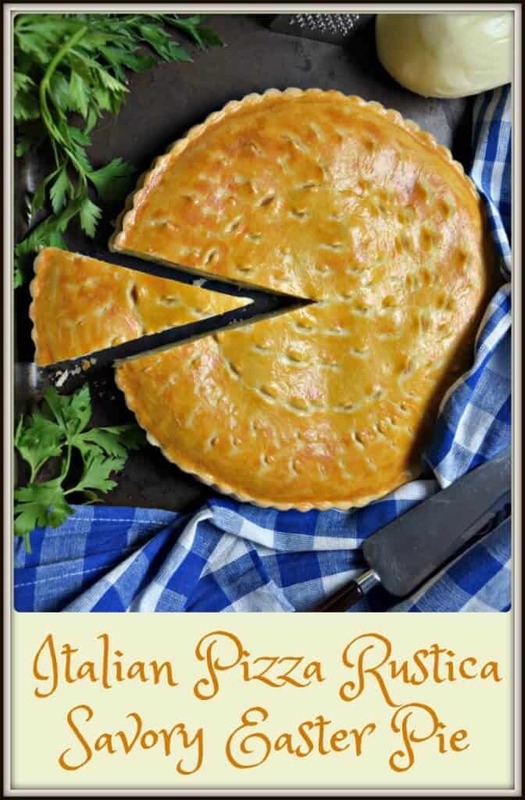 Today, I would like to share this Easy Italian Pizza Rustica aka Savory Easter Pie Recipe with all of you. This rustic pie can also be referred to as Pizza Piena, Pizza Repiena, Pizzachino, Pizzagiena, Pizza Ghen, Torta Pasqualina… I could go on, but I think you get the picture. Don’t you just love regional Italian cuisine? As far as I can tell, nobody seems to mind what it’s called because it’s so so good. But what exactly is it? Well, I can tell you that despite its name, it’s not a pizza as defined in North America. Basically, this pizza rustica is made with a variety of cheeses, cured meats, eggs and sometimes greens, all enveloped in a dough that resembles a pie crust. Due to the fact that this is a very regional dish, every family has their own version. Today, I would like to share another one of my favorite Easter recipes. 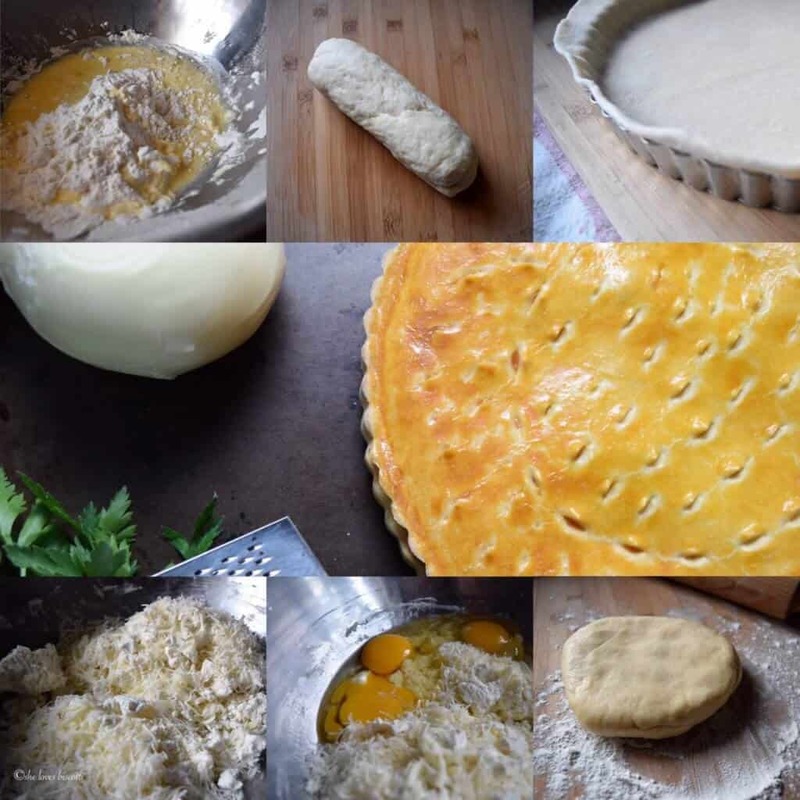 The dough for Pizza Rustica: In this simple pie crust recipe, I have used the technique of grating frozen butter into the dry mixture and incorporating it with my finger tips. I find this method so much easier than using a pastry cutter or even the two knives method to achieve a mixture that resembles coarse crumbs. If you recall, this is the technique I used to make these wonderful buttermilk biscuits. Works like a charm, every single time. Once I have added the liquids, the dough comes together in no time. I will then separate and shape the dough into two discs (one slightly larger than the other); wrap each in plastic wrap and refrigerate while I combine the ingredients for the filling. The filling for Pizza Rustica: The filling is very straightforward to prepare. In a medium sized mixing bowl, combine the variety of cheeses, beaten eggs, and cured meats (you can omit this for a vegetarian version). 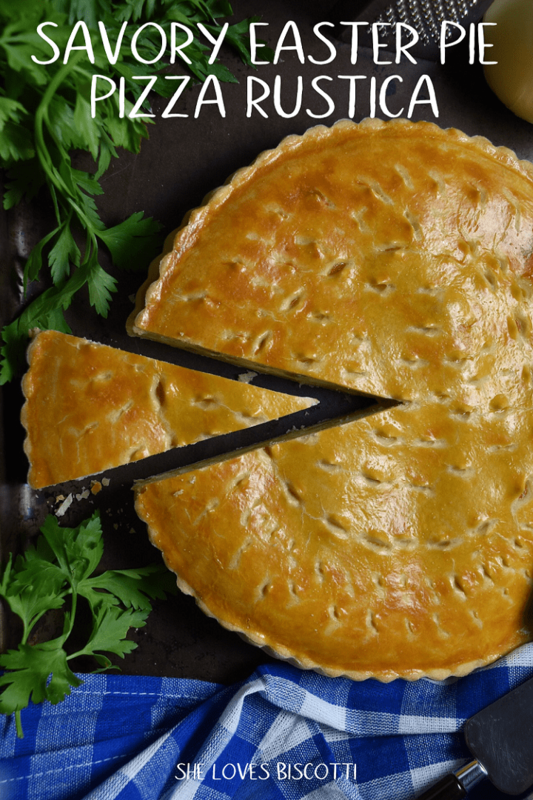 In order to assemble the pie, roll out the slightly larger piece of dough in order for it to fit the bottom and the sides of a 9-inch fluted tart pan with a removable bottom. Fill the pie with the cheese mixture. Roll out the other piece of dough and place it on top of the filling. Pinch the bottom and top pieces of dough together to make sure the filling is properly enclosed. I will use my scissors to snip a pattern in the dough. 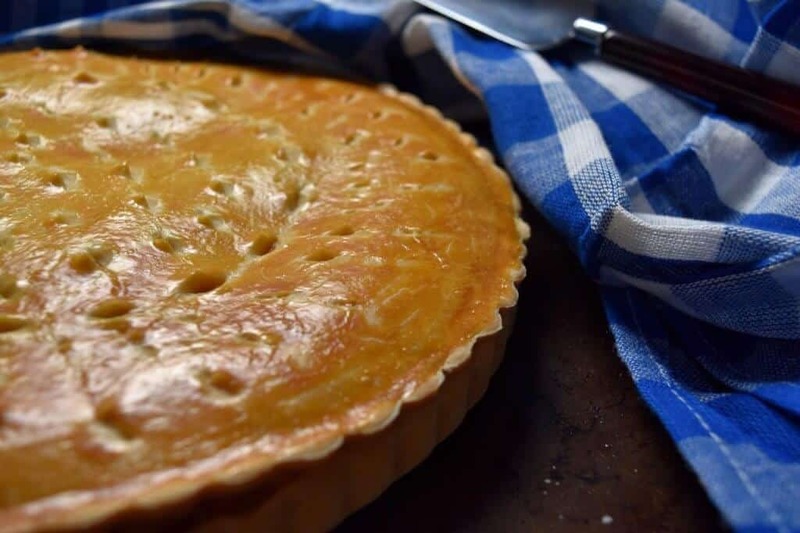 By brushing the top with a beaten egg yolk, the pie will obtain a golden color when baked. You can see that after it has baked, it pulls away from the sides of the pan and is easily removed. Just make sure your bottom and top crust are properly sealed otherwise the dough will split open. There really is no one version of making the filling (or even the dough) for this pizza rustica recipe. As was mentioned, this is a very regional dish and as such, there are so many variations. You would probably not be surprised to learn that I prefer a simple version when making this pie. As you can probably guess, this is a food of my childhood. Let’s just say that this was not a dish I appreciated when I was very young. I found it too salty, unappetizing and unappealing… not a kid-friendly food, at least not in my eyes. I just wanted to eat my chocolate Easter egg! Thank goodness taste buds change as you get older. 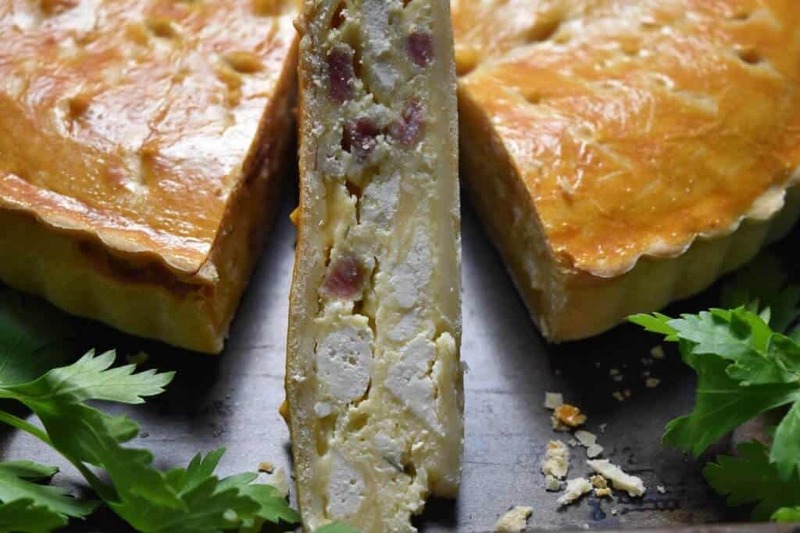 My husband, who was born and raised in the city of Muro Lucano (in the province of Potenza) informs me that this pizza rustica would often be made to celebrate la Pasquetta, which is the day after Easter. Tradition would have it that on Easter Monday, there would be a big family get-together, usually an extended family picnic in the country. 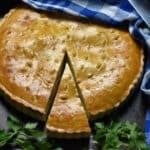 In North America, this Easy Italian Pizza Rustica aka Savory Easter Pie Recipe is often served at Easter, as part of the appetizer line-up, in an attempt to keep Italian Easter traditions alive. In case you are interested, I adapted this recipe from this website. Food and tradition go hand in hand, especially during any holiday period. 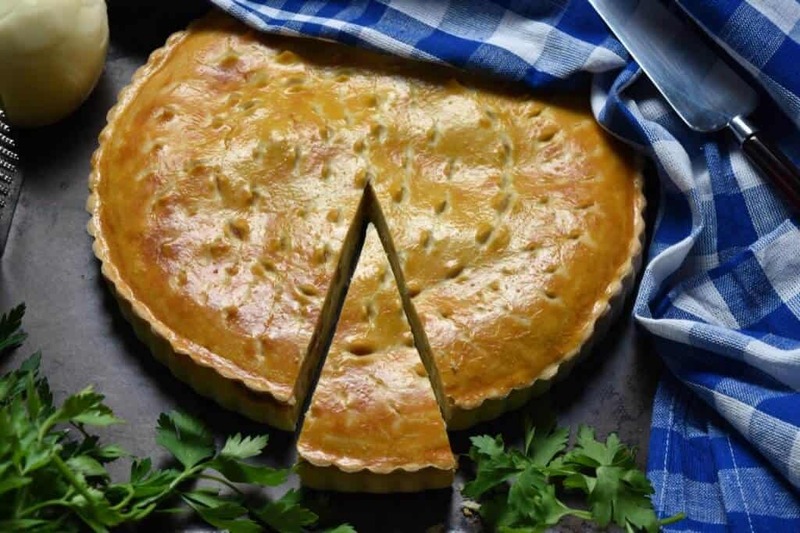 This Easy Italian Pizza Rustica aka Savory Easter Pie Recipe is the perfect appetizer to enjoy with family and friends during Easter weekend. 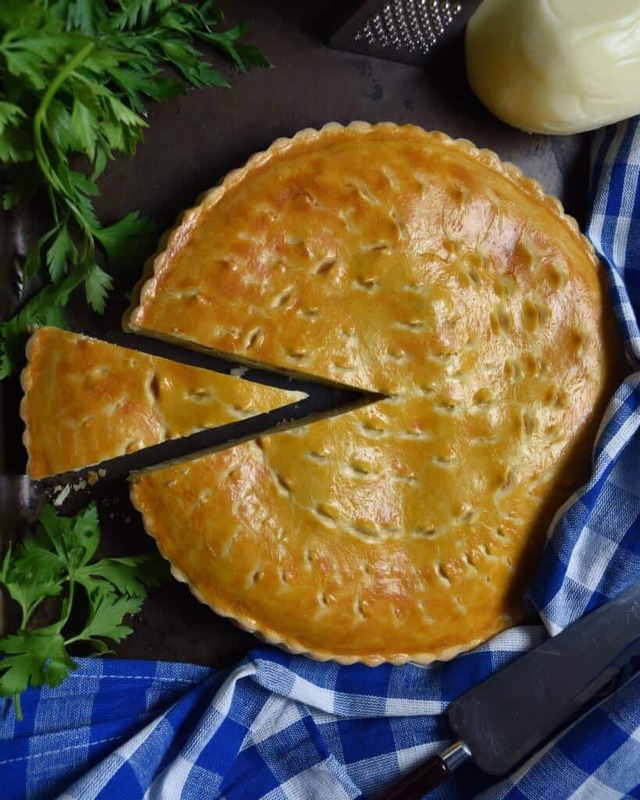 This Easy Italian Pizza Rustica aka Savory Easter Pie Recipe is the perfect appetizer to enjoy with family and friends during Easter weekend. In a large bowl, sift together the flour and the salt. Toss together with fingertips in order to incorporate the butter. In a separate bowl, beat the egg with the ice cold water. Add to the dry ingredients and combine. On a floured wooden board, knead lightly for one minute. Separate and flatten into 2 discs (one slightly larger than the other). Wrap in plastic wrap and refrigerate for about 20 minutes. In the meanwhile prepare the cheese filling. In a medium sized bowl, combine all of the ingredients for the filling. Preheat the oven at 350°F (175° C). On a lightly floured wooden board, roll out the slightly larger piece of dough in order for it to fit the bottom and the sides of a 9-inch fluted tart pan with a removable bottom. Make sure there is some overhang. Moisten the edge of the dough with a little bit of water. Roll out the other piece of dough and place it on top of the filling. Pinch the bottom and top pieces of dough together to make sure the filling is properly enclosed. Poke holes across the top with a fork. A scissor can also be used to snip at the top crust. Brush the top pie crust with a beaten egg yolk. Bake in a pre-heated oven at 350° F (175° C) for about 45 minutes. Can be served warm, at room temperature or cold. LOVE THIS PIZZA RUSTICA RECIPE? PIN IT TO YOUR APPETIZERS BOARD! What an attractive pie and appealing recipe. I liked your story as well – food memories are the best, aren’t they? I will try your recipe this Easter. Thank you for sharing. This is such a beautiful looking pie. I can only imagine how amazing it smells while cooking! I’ve never had anything quite like this, but by the look (and sound) of it, I’d love it! Look at that golden brown colour! It’s just perfect!!! I really enjoy learning about these traditional Italian dishes. I’ve never seen this Easter dish before, but it looks great! Your tip of grating frozen butter to make the crust is brilliant! That would ensure uniform distribution. Thank you for sharing! This pizza rustica is a regional recipe and made exclusively at Easter… at least in my family. FROM PALERMO THERE IS A PIZZA CALLED “FACCIA DI NONNA” IN INCORPORATES , BREAD CRUMBS, ANCHOVIES, ONIOS, TOMATOES ,NOT SURE WHAT ELSE. I FOUND IT FIRST IN PALERMO , THEN ODDLY ENOUGH HERE IN NYC. A PIZZERIA GUY FROM PALERMO USED TO SELL IT. LOOKS LIKE DRIED BREAD CRUIMBS BUT ONCE YOU EAT IT , IT BURST WITH FLAVOR. DO YOU KNOW ANYTHING ABOUT IT PIZZA , AND MAYBE AN AUTHENTIC RESIPIE? I grew up with both sweet and savoury pies for Easter. I look forward to trying this recipe. This recipe for Pizza Rustica is very much like what I grew up with. Generally, my grandmother added hard cooked eggs to the filling. I can so relate to your recalling how as a child, this was not exactly a favorite dish. Your finished Pizza Rustica looks absolutely amazing, any Italian grandmother would be proud to serve it. Could you possible give us measures in cups rather than grams for the crust. I have been searching for years for a crust recipe for this pie. I remember my mother’s as being much more “substantial” than a traditional piecrust. I did make your Easter Rice Pie (with ricotta) and the filling was outstanding and just as I remembered. The crust was not. I have a feeling that matching this crust with that pie will be just the ticket!